When you look at the history of the Denver Nuggets, it’s relatively easy to break down the stages and highlights throughout the years; both good and bad. There’s the beginning; when the Nuggets became an actual NBA team. One of the greats, David Thompson, helped usher in the new era and provided Denver its first glimpse at a star, even though basketball stars were much different compared to the NBA stars of today. Nonetheless, the Nuggets tasted some early success upon entering the NBA. Then there were the Alex English days. To this day, English is considered one of the great players in NBA history. His teams went to the playoffs for 9 straight years and played in 1 of the only Western Conference finals in the Nuggets history. There were a few rough patches in the late 80’s/ early 90’s until Dikembe Mutombo was drafted in 1991. He was a defensive player of the year and was the key contributor in the 8th seed Nuggets’ upset over the 1st seed Supersonics. After Mutombo left the Nuggets went into a dark time, missing the playoffs 8 years in a row. In 2003, the Nuggets drafted Carmelo Anthony one of the leagues best scorers throughout his career. George Karl was hired nearly a year later and the two of them built a playoff team for years to come. However, it wasn’t until Chauncey Billups came BACK to Denver that the Nuggets got past a 1st round. In 2008 they made it to the Western Conference Finals for only the second time in Nuggets history with Mello, Billups and Karl leading the team. A few years after that run, Mello was ready to spread his wings and fly off to the big city. From there, the Nuggets were able to secure a trade for Mello (Billups included) for guys like Danilo Gallinari, Wilson Chandler and Timofey Mozgov. Still lead by Karl, the Nuggets post Mello would remain a top team in the West, not missing post season play once in Anthony’s absence. Playoffs were the norm for the Nuggets. But that was the problem. Ownership and the fan base grew tired of 1st round exits and no marketable superstar. So George Karl was fired and in came Brian Shaw……Fast forward as that was another ugly time in Nuggets history. Mike Malone. That’s better. The Nuggets began rebuilding in 2015 without ever really admitting the fact. Jamal Murray, Garry Harris and of course, Nikola Jokic would be the new faces of the team and so far so good. Malone’s Denver Nuggets are in a back and forth battle with the class of the NBA, the Golden State Warriors, for 1st place in the Western Conference. With 37 wins and 29 games remaining, Denver should easily punch a playoff ticket for the first time since 2012/2013 season (has it really been that long?) Mike Malone and GM Tim Connelly have built a deep roster full of team oriented players that truly buy in to what their coach is selling. So what is this era in Nuggets history? Will we remember this as the time they became one of the best teams in the league? The team that couldn’t get by the Warriors like Stockton and Malone’s Jazz when it came to Jordan’s Bulls? Or will we call this era the time of the Joker? After 3 1/2 years in the league, Jokic has gotten better every single year. After being drafted in the second round in 2014, Nikola was suppose to be a project player. After all, the Nuggets had their big man in Jusuf Nurkic. But not long into Jokic’s second year, it was evident that he would ultimately be the starting big man. His career numbers aren’t overwhelming; 15.9 ppg, 9.4 rpg and 5 apg but in his 4th year, his first all-star year, he’s averaging 20 ppg, 10.5 rpg and 7.7 and has become a triple double machine. MVP chants shower him at the free throw line inside the Pepsi Center and his teammates look to him as the leader on the floor. It’s difficult to say Jokic is the best Nugget at this time as we’ve seen such a small sample size compared to English’s 10 years, Thompson’s 7 and Melo’s 8 but the growth we’ve witnessed from the Joker is not to be ignored. Unlike most of the stars in the past for Denver, Jokic was not an instant success. Melo was a star from day 1 and took his team to the playoffs in his his rookie season. Jokic’s progression has been slow but steady. Case and point; last year against Minnesota in basically a playoff game (winner gets in, loser stays home) Jokic played one of his best games in perhaps his biggest. He scored 35 points and grabbed 10 boards in a losing OT effort to the T-Wolves but from that point it was clear, the Joker would be a big player that made big plays in big times. Melo never evolved. He was a scorer and that was that. Getting him to play defense or operate in a well designed system was not gonna happen. English was a well rounded player but still only averaged 4 assists a game in his 10 years with the Nuggets. Nikola looks at getting people involved like it’s his job. Like a hall of fame QB, Jokic scans the floor, constantly looking for the next pass, the next threading of the needle, the next big time assist. But in crunch time, like stars tend to do, the Joker takes control. He backs down a little harder and finishes a little stronger. The Nuggets have little to be proud of in terms of overall success. When you have retired numbers like Mutombo’s hanging from your rafters you know the bar is not nearly as high as great organizations like Boston and LA. I’m not taking anything away from Mr. Finger Wag as I was a huge fan but he played only 5 seasons in the Mile High City and saw just 2 playoff runs in that time (one first round win over a #1 seed). The point being that when it comes to the Denver Nuggets, success is measured more so how much a player meant to the organization rather than how much winning they were responsible for. Even further, no player from Denver’s past has a jersey hanging at the Pepsi Center, other than Mutombo’s, that played beyond 1990. Sure, Anthony will likely see his up there soon but after nearly 30 years, 1 or 2 greats is a tough pill to swallow. Is this the era of the superstar in Denver? Perhaps. But with other solid players like Garry Harris and Jamal Murray, I tend to look at this time in Nuggets history as the era of legitimate greatness. 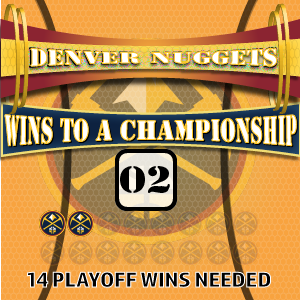 Before, the Nuggets retired numbers for mediocre success (playoff births, 1st round advancement, and a few individual awards) But in the next 10 I predict that Denver will honor players that helped them achieve greatness (Western Conference appearances, Western Conference titles and ultimately, a championship). So the 2014-??? time frame might very well be known as, the Championship era. Let us sit back and enjoy. How Much Time Does SB 50 Give John Elway?